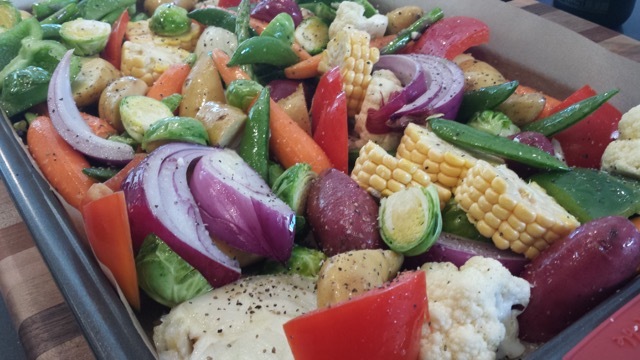 Oven roasting vegetables is by far my favorite way to prepare and eat fresh vegetables. 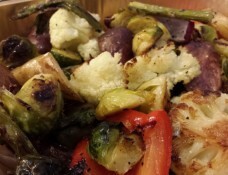 I absolutely love the sweet natural flavor that comes from roasting vegetables. During the winter months there are so many good root vegetables available for roasting, and during this time of year I roast a ton of fresh veggies. Some of my favorite vegetables to roast are multi-colored fingerling potatoes, fennel, carrots, red onions, snap peas, peppers, turnips, and small pieces of corn on the cob. Amazingly, even the normally bitter tasting turnip become sweet when roasted. That’s because something sort of magic happens during the roasting process. The high heat transforms the vegetables by causing them to caramelize, leaving a natural sweet flavor. Keep in mind that different vegetables require different roasting times. That’s because softer vegetables and those that hold moisture like peppers, leeks, zucchini, asparagus, tomatoes, mushrooms and green beans take less time than hard root vegetables like potatoes, beets, carrots, parsnips. Try to combine vegetables with similar roasting times together to ensure even cooking. When using a conventional oven, I usually roast my vegetables at about 425 degrees, but you can roast vegetables between 375 and 475 degrees. At 425 degrees my vegetables are usually ready in about 20 minutes. The higher the temperature, the shorter the cooking time. The vegetables are done when the centers are soft and creamy and the outer edges are golden and crispy. Be sure and watch them carefully if roasting at higher temperatures. At this high temperature, most vegetables will roast in about 15- to 20 minutes. Line a cookie sheet with parchment paper. Helps to keep the vegetables from sticking and makes for easier cleanup. If you don’t have parchment paper, spray your cookie sheet with cooking spray. Cut vegetables evenly. Cut your vegetables in similar sizes, to help them roast and brown close to the same time. Throw vegetables in a large bowl and sprinkle with extra virgin oil and toss. Use your hands if needed to make sure covered on all sides. A couple of tablespoons per pan should be sufficient. Sprinkle with salt and pepper. Spread vegetables evenly on a baking sheet with low sides. Metal is best for roasting. If your pan is too crowded, your vegetables will steam rather than roast. If you have too many vegetables to fit onto one pan, use two. Also position them near the edges of the pan which makes them brown better. Be sure to stir vegetables a few times while cooking so they will brown evenly on all sides. Try different oils like coconut oil, peanut oil or safflower oil. Just make sure your oil is very fresh. Roast vegetables and fruit together like butternut squash with apples.